….a full bookshelf. The Sticker household is nine books richer this afternoon. Eight hard and one paperback. Awesome Books delivered a series of secondhand and brand new volumes for me, while Amazon deposited two heavyweight historical tomes upon our doorstep. 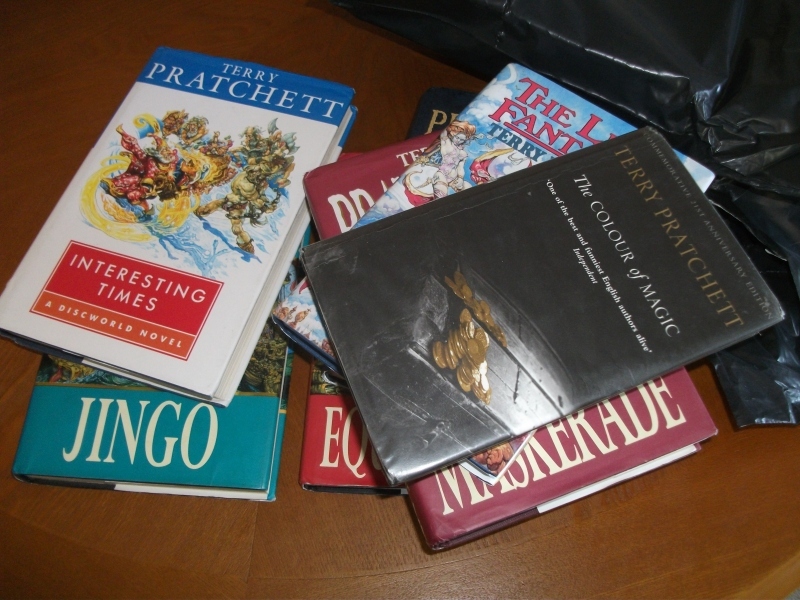 After over eight years, my once almost complete Terry Pratchett and Douglas Adams Hardback book collection is gradually being rebuilt. This promises to be a curl up in a corner and read weekend. With real books made of real paper. With real alcohol in real glasses, and possibly a side trip to see some real furry creatures from Alpha Centauri. And a few real guffaws. Which will be very good for my nervous and cardiovascular systems. First dickhead to say ‘but eBooks are better’ in the comments will be mocked unmercifully. Religious nutters and political cold callers, between whom there is no neurological difference if you believe what Stefan Molyneux has to say, (see video below) will be left to bake on our doorstep. I’m almost inclined to put a clear plastic cover over the doorbell with an ‘Emergency use only’ sticker on it. Wonder if Canadian Tire do such an item? The Colour of Magic, The Light Fantastic, Equal Rites, Maskerade, Jingo, Interesting Times and the Amazing Maurice and his Educated Rodents. We have house guests over this weekend, so have been pouring libations to Bacchus like Niagara in flood. Which is nice, as Mrs S and I have had some very happy news for a change. About bloody time too. So we’re celebrating, or should that be decerebrating. Whatever. At the moment of writing, Mrs S is introducing them to ‘Lord of the Rings’ on DVD. “Oh that old thing. I thought ‘Walking the Streets’ was dead and buried. What about it?” I replied. How did she know about that? “Can I have a copy?” She asked. “It’s out of print.” I told her. “Has been since 2009.” Then I had an idea. “Hang on.” I dived off and rootled around in our bookcase. Sure enough, there was the one proof copy I’d kept, although God knows why. Must ask him some day, he seems to have all the answers. I handed it over. “Take it. My gift.” I said. “I’ll pay you for it.” She said. “Nonsense. I won’t hear of it.” I demurred. She read one of the excerpts and giggled like the schoolgirl she’d been nearly eighty years ago. I almost blushed. “Ooh yes.” Said our old friend. Well, when you’ve passed your eighth decade I suppose you’re allowed a little more latitude than most. Now I’m sitting in my office typing this post, glass of Argentinian Malbec in one hand, I recall that the offending text still resides on my hard drive. There’s also a few other anecdotes which weren’t included with the 2007 edition because they were too damn near the knuckle. Which midwifed the thought; if I put out the text as an eBook at five bucks a pop on Amazons Kindle, Kobo, iBookstore or suchlike, would anyone be interested? Just a thought. Too busy to blog. Even more family are due to descend upon us shortly. Still running errands for terminal friend. Major project finished and have been asked to deliver a talk at a book signing (Write presentation, practice speaking, rehearse, promotional material design, work, work, work). Mrs S has insisted I make time out for fishing as I’m as hyper as a puppy with a new squeaky toy. All in all, having a nice time. I think. I can’t think of a topic I haven’t beaten to death, which is why posting has been pretty sporadic of late. That’s because people who simply refuse to use their brains insist they are fit for elected office, and because there are so many people who live in a fluffy pink la-la world, and think everyone else has to, too. I’m just trying to ignore them and hope they’ll go away. For myself, I’m busy welding words together over a red hot keyboard, and have resurrected the ‘Stepdad’ Manuscript, which is a humorous but hopefully instructive treatise about my experiences as the stepfather of two teenage girls. Which I hope to release shortly in cut down form as an eBook. Posting will be even lighter than usual because there’s a lot of fruit harvesting and processing to be done. More plums than I know what to do with, and the grape vines and blackberry bushes in our little back yard look like giving up a bumper harvest. Hunting season starts in September.